So maybe the sky isn’t falling, but it’s quite the coincidence that an asteroid and a meteor both descended upon our little plot of the universe within about 15 hours of one another. 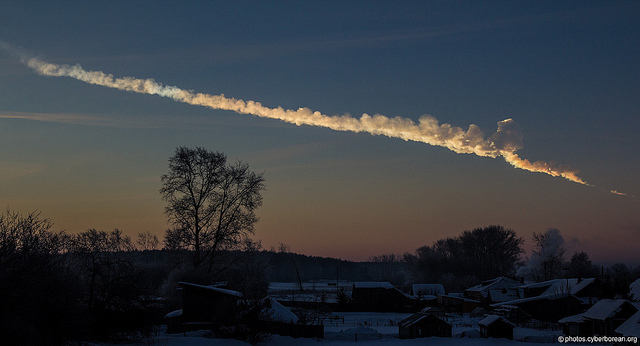 While many skywatchers have been anxiously awaiting the close approach of Asteroid 2012 DA14, they were completely taken by surprise when a 500-ton meteor streaked across the Russian Ural sky earlier the same day. The meteor — caught on video by many sources — easily rivaled the sun in brightness and struck a frozen lake outside of Chelyabinsk, Russia. The massive damage was caused by the sonic boom resulting from the speed with which the object ripped through the atmosphere, not by debris from the meteor itself. For some reference for the uninitiated, there is a difference between an asteroid, a meteor and a meteorite. Asteroids are small rocky objects that orbit the sun and range from 600 miles across to tiny dust particles. A meteor is any object that enters the earth’s atmosphere, where friction with the air causes it to super-heat and cause a bright streak across the sky. Meteors are more commonly referred to as shooting stars. A meteorite is a meteor that survives the journey through the atmosphere and strikes the ground. Most meteorites are rock containing some combination of iron and nickel, which help them resist more heat than the average rock. Click to see the astroid near the center of the image in motion. The asteroid we’re talking about, discovered last year, is 45 meters long and successfully missed the earth’s surface when it passed into the Earth-satellite orbiting system at 2:24 pm ET. Stargazers in Australia, Asia, and Eastern Europe were able to watch the asteroid cross their skies with the aid of a telescope or binoculars. The gif above depicts asteroid 2012 DA14 as it was seen on Feb. 14, 2013, at a distance of 465,000 miles (748,000 kilometers). The animation was created by astronomers at the Remanzacco Observatory in Italy using observations obtained remotely from the Faulkes Telescope South in Siding Springs, Australia. The asteroid is the large bright spot moving near the middle of the field of view. The other dots are stars in the background. A line that appears in one of the frames comes from a satellite that passed through the field of view. Considering how hyped-up as this asteroid was in the news, let me be clear that there was never a fear that this would have ever been “doomsday” event. On its closest approach to Earth, it was predicted the asteroid would be traveling at 7.8 kilometers per second, roughly eight times the speed of a bullet from a high-speed rifle. If the asteroid had hit the earth, it would have hit the earth’s surface with a force of a 2.4 megatons of TNT. This force is comparable to the event in Tunguska, Russia, in 1908. That asteroid entered the atmosphere and exploded, leveling trees over an area of 820 square miles, about two-thirds the size of Rhode Island. 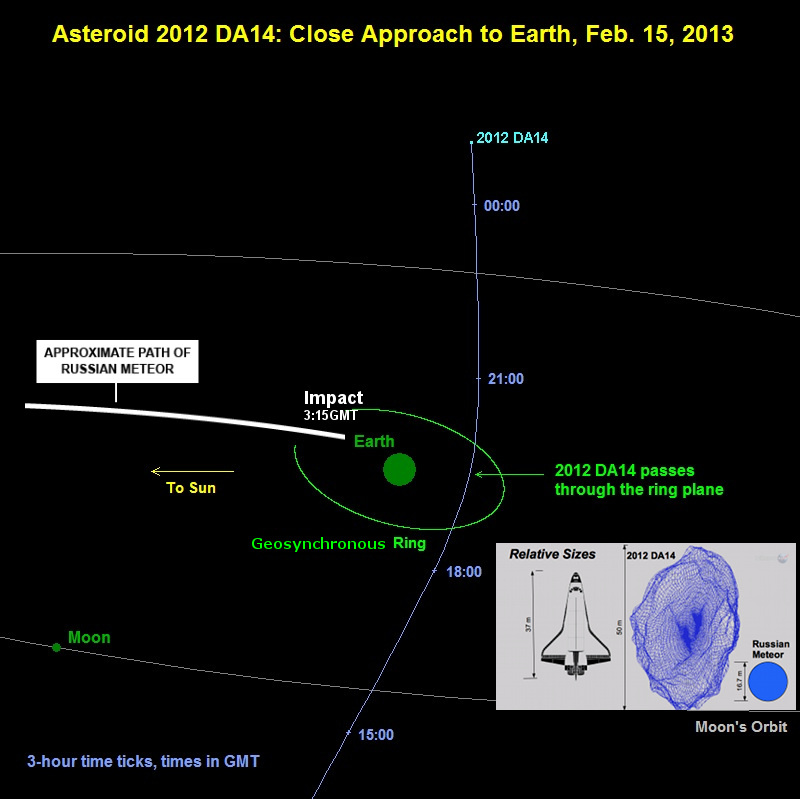 Like that rock, 2012 DA14 would likely not have left a crater. Since its discovery last year, Asteroid 2012 DA14’s orbital trajectories have been studied enough to determine that the object poses no danger to earth for at least the next 100 years. Meteor trace about taken one minute after the event. It’s completely natural to think that the meteor and the asteroid that nearly missed us would be celestially related, but they aren’t! How do I (or any astronomer) know? Well, their orbital trajectories were completely different, meaning that they couldn’t have originated from the same object in space. If you think about how the Earth spinning, the meteor streaked around 3:25GMT. The asteroid, also viewable from the region wasn’t at its closest approach till 19:24 GMT. In those intervening hours, Russia’s location with respect to the night sky significantly changed with the earth’s rotation. As a note, since the image at the top of the article was created on Friday, NASA revised its estimate of the meteor’s size upward late Friday from 49 feet (15 meters) to 55 feet (17 meters), and its estimated mass from 7,000 to 10,000 tons. Scientists call such space debris near-Earth objects (NEOs) and have observed nearly 10,000 of them since NASA started using telescope tracking in 1995, according to NASA’s NEO program website.This program spends all of its time scanning the skies for possible threats to earth and its orbit; unfortunately this amount of time still only covers about 5% of the sky. This is why certain objects are found ahead of time and others completely surprise us, sometimes in the same day! Once discovered, NASA generally tracks NEOs that range in size from one to approximately two kilometers in diameter and continually orbit the Earth, some closer than others. You might wonder why NASA doesn’t just monitor more of the sky. Simple, they don’t have the resources. Only about 0.05% of NASA’s budget is allocated to the NEO program and NASA’s current budget is only 0.4% percent of the entire United States’ budget. This means that one fiftieth of one percent of the entire US budget is allocated to finding these potential “doomsday” threats to our planet. Expanding this search program is just one of the many reasons that NASA funding needs to be significantly increased.